Heat oven to 400°F. 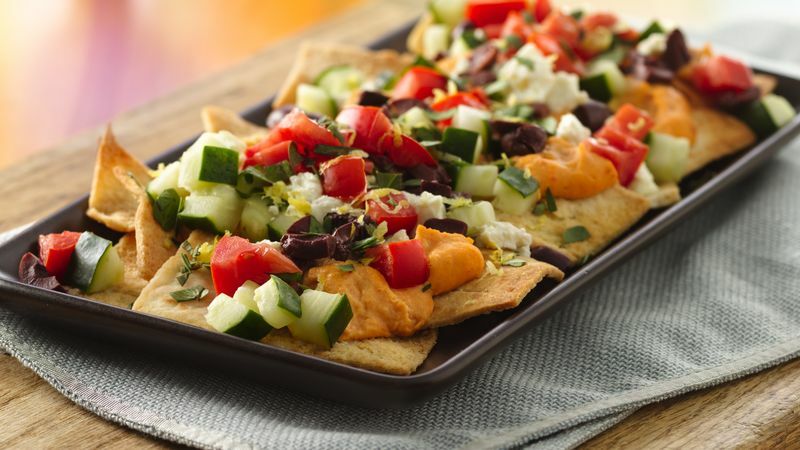 Arrange pita chips on heatproof serving platter. Dollop hummus over chips. Top with cucumber, tomato, olives and cheese. Bake about 4 minutes or until hummus is warm. Sprinkle oregano and lemon peel over hot nachos. Serve immediately. To spread hummus evenly over pita chips, place hummus in resealable bag; cut off bottom corner of bag and squeeze hummus over chips. Going on a picnic? Bring all ingredients and create the nachos on-site. No need to heat.